Documents from World War II in the National Archives are in grave peril and are literally turning to dust! Most of the paper used during the war years was heavily acid based, and time is taking its toll. Documents from previous eras, World War I or even the Civil War, will outlast those from World War II. Congress has mandated that the entire National Archives be digitized, but with millions upon millions of records, they cannot do so without some big-time private sector help. We, the Arnett Institute, have stepped forward to assist in this mammoth project of scanning the WWII documents in the National Archives to prevent these important records from being lost for all time. Form a 501(c)(3) non-profit corporation. Done! Recruit a qualified person in the DC area to do the actual scanning. Done! Raise money do to a model scan to their specifications. Put together an aggressive fund-raising campaign to scan on a regular basis. And that brings us to this ScanningWWII.com website. Using Facebook, Twitter and Pinterest to engage people with a shared passion for WWII, our goal is to bring awareness to the plight facing WWII documents and our commitment to pitch in and help. 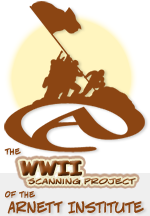 Further details of the Arnett Institute's WWII Scanning Project can be read on our "About Us" tab above, along with information about how you can donate to help us successfully launch this worthy undertaking.